The 3rd edition of African Slum Photo Festival (ASPF) is here. Bigger and better. 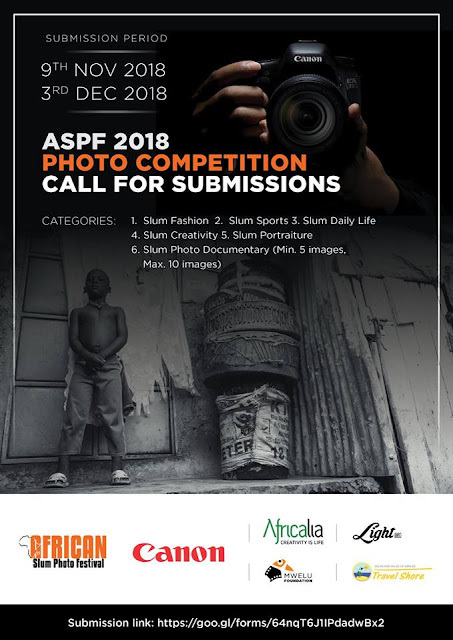 ASPF aims to support real photography talents in the slums around Africa. As we experience a booming growth in the African creative industry, artists continue to be innovative by coming up with different platforms to showcase and communicate to their fellow creative and in that process increased their visibility both in the region and to the outside world. As an organization that nurtures photographic skills for youths, we have taken a step to give slum-based photographers in Kenya and Africa in general a platform to develop their skills, share experiences and showcase their hard and creative works. Photography has proven not once or twice to be a powerful tool of communication that can reach far and beyond imagination to sensitize and trigger change in many regions of the world. Slum photographers continue to impress the world with their images that continue to showcase a different world and lifestyle not known to many. To give Upcoming African Slum based photographers a platform to develop their photographic skills through mentorship. Create a link between upcoming photographers and professionals in the industry. To Mentor 15 best upcoming slum based photographers in Africa annually. To showcase the best photography works of young photographers in African Slums. To nurture young talents in photography. To strengthen the African slum photo festival as a platform for slum based photographers.